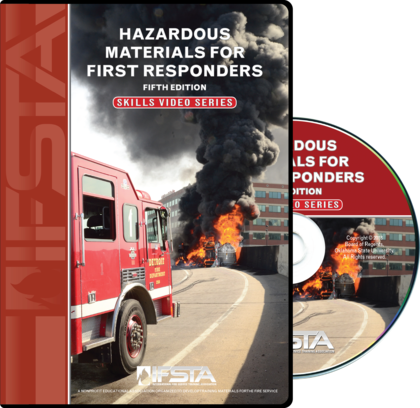 Hazardous Materials for First Responders, 5th Edition Skills Video Series demonstrates all 40 NFPA 1072 JPR’s in video format for Awareness and Operations. Each video follows the IFSTA skill sheet with step by step instructions. Learn each skill while following the video. Demonstrate your skill as you prepare for end of chapter skill checks and end of course skill examinations. The videos enhance classroom training and can be used by students to learn skills during hands on practice sessions. The Awareness and Operations videos are clearly labeled for easy access. The videos address the requirements of NFPA 1072, Standard for Hazardous Materials/Weapons of Mass Destruction Emergency Response Personnel Professional Qualifications, 2017 Edition. This product contains 1 DVD and is compatible with any standard DVD player. Make appropriate notifications of a hazardous materials incident. Identify indicators and hazards present at a hazardous materials incident using approved reference sources. Implement protective actions at a hazardous materials incident. Analyze a hazardous materials scenario to identify potential hazards. Identify actions available at a hazardous materials incident. Provide scene control at a hazardous materials incident. Evaluate progress made at a hazardous materials incident. Select appropriate PPE to address a hazardous materials scenario. Don, work in, and doff structural fire fighting personal protective equipment. Don, work in, and doff a Level C ensemble. Don, work in, and doff liquid splash-protective clothing. Don, work in, and doff vapor-protective clothing. Perform technical decontamination on ambulatory people. Perform technical decontamination on nonambulatory victims. Perform mass decontamination on ambulatory people. Perform mass decontamination on nonambulatory victims. Demonstrate the proper use of pH paper to identify hazards. Demonstrate the proper use of pH meters to identify hazards. Demonstrate the proper use of reagent test paper to identify hazards. Demonstrate the use of a multi-gas meter (carbon monoxide, oxygen, combustible gases, multi-gas, and others) to identify hazards. Demonstrate the proper use of radiation detection instruments to identify hazards. Demonstrate the proper use of dosimeters to identify personal dose received. Demonstrate the proper use of photoionization detectors to identify hazards. Demonstrate the proper use of colorimetric tubes to identify hazards. Perform victim rescue operations at a hazardous materials incident. Perform remote valve shutoff or activate emergency shutoff device. Demonstrate evidence preservation and sampling. Identify and avoid booby traps at an illicit laboratory. Perform operations at an illicit laboratory hazardous materials incident.